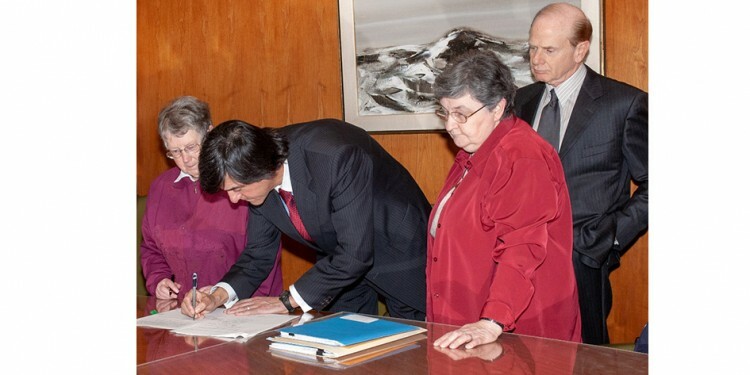 Present at the ceremony to finalize the purchase of property from Les Soeurs de Sainte-Croix were (from left) Sister Annette Legault, JGH Executive Director Henri Elbaz, Sister Thérèse Lefrançois and JGH President Stanley K. Plotnick. 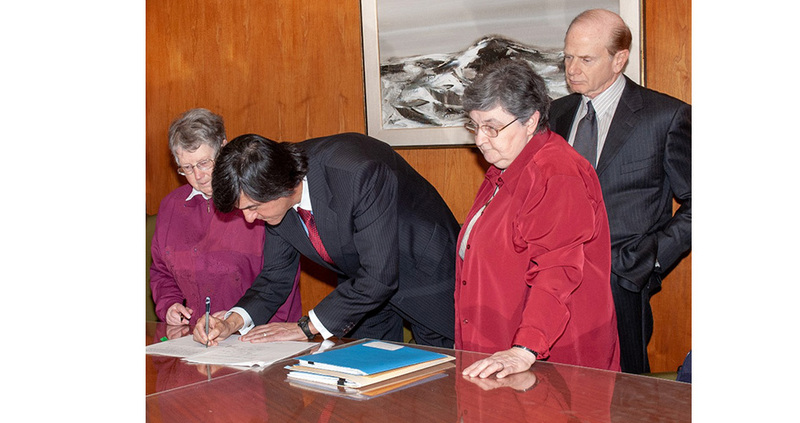 The much-needed expansion that the JGH has undergone during the first two decades of the 21st century would not have been possible without a pivotal event that took place on February 1, 2005: the purchase of nearly six acres of land and two buildings from Les Soeurs de St. Croix (Quebec Region), an educational order of nuns. The property just north of the hospital, stretching from Côte‑des-Neiges to Légaré, enabled the hospital to convert the convent into Pavilion H, while providing the land on which to build Pavilion K.
The agreement marked the culmination of a warm relationship that existed for decades between the JGH and Les Soeurs de Sainte-Croix. During occasional social visits over the years, the JGH expressed an interest in buying the land and asked to be the first to be offered the property whenever the Sisters felt they were ready to sell. In 2002, the Sisters informed the hospital that they were ready to sell the property and a special letter authorizing this transaction was issued by the Vatican.